Explanation: A lesser known sight in the nebula-rich constellation Orion, NGC 2174 can be found with binoculars near the head of the celestial hunter. About 6,400 light-years distant, the glowing cosmic cloud surrounds loose clusters of young stars. 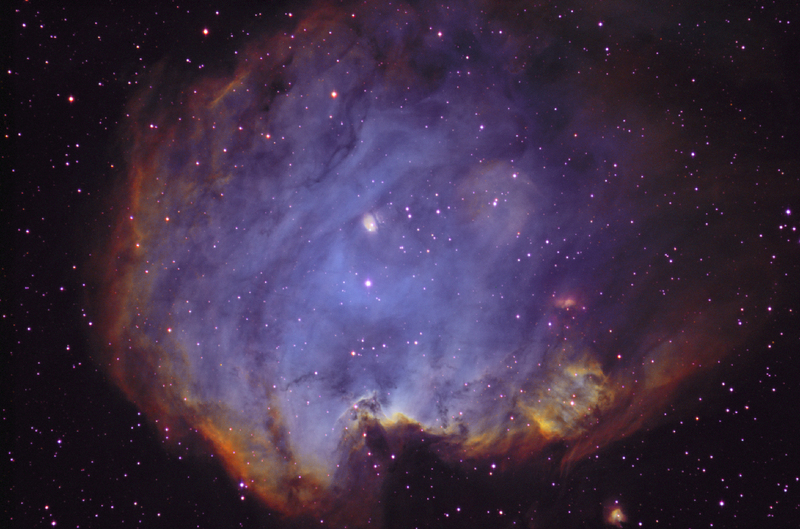 Covering an area larger than the full Moon on the sky, this stunning narrow band image adopts a typical color mapping of the atomic emission from NGC 2174. The false-color mapping shows otherwise red hydrogen emission in green hues and emphasizes sulfur emission in red and oxygen in blue. Placing your cursor on the image will reveal an alternative image of the nebula made through broad band filters. The broad band image combines filters in a closer analogy to human vision, dominated by the red glow of hydrogen.